Postill, J. 2014. Spain’s indignados and the mediated aesthetics of nonviolence. In P. Werbner, K. Spellman-Poots and M. Webb (eds) The Political Aesthetics of Global Protest: Beyond the Arab Spring. Edinburgh: Edinburgh University Press. One remarkable feature of Spain’s indignados (or 15M) movement when compared to similar movements elsewhere in the region is its dogged commitment to nonviolence, even in the face of police provocation and brutality. This chapter, based on anthropological fieldwork in Barcelona and on an extensive reading of the indignados literature, explores this puzzling phenomenon through a dual focus on media and aesthetics. I ask what part, if any, new social and mobile media have played in the emergence and stabilisation of a distinctive nonviolent aesthetics in Spain. My argument is that this new aesthetics is indeed complexly mediated, both by ‘traditional’ mainstream media and by new platforms and technologies such as Facebook, Twitter, YouTube and smartphones. I identify five key principle of the indignados’ protest aesthetic, namely an embodied rejection of the ‘diverse tactics’ of earlier mobilisations (which included violence), a strategic use of ‘jocose emotivity’ (Fernandez de Rota 2013), sophisticated social and mobile media practices, a transposition of hacker ethics and aesthetics to occupied public spaces, and a perpetually transient, open-ended temporality. This powerful new aesthetic synthesis, I conclude, has positioned Spain – until recently a technological laggard with a dormant civil society – in the global forefront of techno-political innovation and social change. If the indignados are so angry, why are they laughing so much? 15M nonviolence is not passive, it is neither abidance by the law nor an adherence to political convention. Rather it is active, rebellious, disobedient and creative. In July 2010 I moved with my family from England to Barcelona, in Catalonia (Spain), to conduct fieldwork on social media and activism for a period of 12 months. Having previously carried out field research on internet activism in Malaysia in 2003-2004 (Postill 2008, 2011), I was eager to learn whether post-2004 platforms such as Facebook, Twitter and YouTube were making any significant difference to the everyday practices and collective actions of activists, albeit this time in a very different corner of the world (Postill 2009). As a Spaniard – a reluctant Spaniard, to be sure, but Spaniard all the same – this was my first experience of ‘anthropology at home’ after many years living and working abroad. When planning the year ahead I did not expect the #SpanishRevolution (as the indignados movement was originally known), certainly not in Catalonia, with its strong tradition of regional nationalism. Indeed the day before my arrival a million people had protested in Barcelona against a ruling by Spain’s Constitutional Court limiting the region’s autonomy. Protesters marched behind a banner that read, in Catalan: ‘We are a nation. We decide’ (Postill 2010). By October 2010 the nationalist tide had subsided and I began to worry that I may not have much internet activism to research in Barcelona. Meanwhile the city’s small but lively ‘free culture’ scene had attracted my interest. Free culture activists fight to liberate ‘all individuals and authors/artists from the abuses of the cultural industry trade’ (La Quadrature 2010). Their movement is intimately tied to the global struggle for internet freedom epitomised by platforms such as Wikileaks and Anonymous (Brooke 2011; Coleman 2012). My research fears were assuaged in December 2010 when free culture activists and internet rights lawyers successfully mobilised to delay the passing of an unpopular copyright bill known as ‘Ley Sinde’ that the Spanish government had drafted under US pressure (Sutton 2012), as revealed by Wikileaks. When the government, backed by the other main parties, passed the law early in 2011 despite the popular outcry, leading internet activists created the online group NoLesVotes. This group called on Spanish citizens not to vote for any of the major parties as a response to this perceived betrayal. NoLesVotes soon joined forces with Anonymous and other non-traditional formations to create an umbrella platform named Democracia Real Ya (DRY). It is no coincidence that DRY’s Barcelona home base was the free culture centre Conservas, or that its Madrid equivalent was the ‘hackerspace’ Patio Maravillas. On 15 May 2011, DRY launched street marches across Spain under the slogan ‘Real democracy now! We are not commodities in the hands of politicians and bankers’. While the marches were well attended, they were not envisaged as a preamble to Tahrir-style mass occupations. As I headed for my Barcelona home after a long day of marching, I had no inkling that this was merely the beginning of a tidal wave of protest that would reach beyond Spain’s borders. The turning point came in the early hours of 16 May, as a group of some forty protesters decided to pitch camp at Madrid’s main square, Puerta del Sol, instead of returning to their homes. One of them, a member of the hacktivist group Isaac Hacksimov (once again, the digital activism connection was not accidental), explained later: ‘All we did was a gesture that broke the collective mental block’ (quoted in Sánchez 2011). Fearing that the authorities may evict them, the occupiers sent out calls for support via the internet. The first person to join them learned about their collective action on Twitter. By 17 May the number of Puerta del Sol campers had swollen to 200 and by 20 May nearly 30,000 people had taken the square. This demographic explosion was mirrored online as countless Twitter threads, Facebook conversations and blog posts were hastily produced and shared. Dozens of other cities around Spain followed suit, and the nascent indignados/15M movement was now a global media event. Soon it would inspire, like the uprisings in Tunisia and Egypt before it, similar developments around the world, including the Occupy Wall Street movement later in the year (Monterde and Postill forthcoming). One remarkable feature about Spain’s indignados movement, noted by numerous observers, is its untiring commitment to nonviolence, even in the face of riot police provocation and brutality. Compared to other southern European states such as Greece or Italy, Spain’s protests have been relatively free from violent actions on the part of the citizenry. But why are Spain’s indignados so devoted to nonviolence? After all, long decades of activist and scholarly debate on the effectiveness of nonviolence as a protest strategy have not settled the issue either way (see Atack 2012; Gelderloos 2007; Martin 2008). One main focus of the nonviolence literature has been the part played by the media, particularly the mass media, in the development of nonviolent social movements. Thus Juluri (2005) has called for a rapprochement between the philosophy of nonviolence and media studies as a way of exposing ‘foundational myths about violence in the media’, such as the myth about violence being natural, historical or cultural. For his part, Samad (2009) argues that nonviolence ‘minimizes the loss of human lives, compared to wars or armed conflicts, and is apt to bring about real political change’. However, he cautions that further research is needed in order to contrast the effectiveness of this strategy in different political and historical contexts. Sumner (1995) examines the role of the print media and TV in the 1960 Nashville Student Movement, in the US state of Tennessee. Students regarded the media as a key means of garnering public support for their cause. Their commitment to nonviolence was amply covered by the media and ‘helped show that if violence occurred, the students were not the ones who initiated it’, for they were portrayed as ‘the good guys’. With the spread of the internet and mobile phones over the past two decades, the question of the technological mediation of nonviolent protest has acquired greater salience. Drawing from multi-sited research in Barcelona and other European cities in the early 2000s, the anthropologist Jeff Juris (2005) explores ‘the complex relationship between performative violence and mass-mediated constructions of violence,’ taking the anti-G8 protests in Genoa as his main case study. Juris defines performative violence as ‘a specific mode of communication through which activists seek to produce social transformation by staging symbolic rituals of confrontation.’ Unfortunately for activists, the conventional mass media frames of the day undermined their strategy by interpreting these confrontations as wanton violence. Juris conducted fieldwork before the current global boom in the uptake of social media and smartphones. At the time, activists had access to indie/alternative media, listservs, email and websites, but mass ‘social Web’ platforms such as Facebook, Twitter or YouTube were not yet in existence. This contrast raises the question of what difference, if any, the new media technologies have made to the recent waves of protest in 2011 and 2013. Social movements scholars such as Castells (2012) or Tufekci (2011) contend that media technologies are ‘game-changers’. As millions of citizens gained access to the internet and mobile phones, says Tufekci, autocrats in countries such as Tunisia or Egypt were no longer able to impose informational embargos on localised protest. As a result, local information/action trickles turned into nationwide cascades that the authorities could not contain. On the other side of the debate sit scholars such as Morozov (2011) who denounce as hyperbole accounts that explore the emancipatory potential of the new technologies. Meanwhile, a growing number of authors, including anthropologists, are seeking to steer clear of the polemics in order to develop nuanced accounts of the part played by digital media in recent protest movements (e.g. Barassi and Treré 2012; Coleman 2012; Gerbaudo 2012; Hands 2010; Juris 2012). In this chapter I take my cue from the latter scholars to explore the mediated aesthetics of the new movements at a time of rapid technological change, a question that has not yet received sufficient attention. Drawing from both my own fieldwork in Barcelona and from a critical reading of the indignados literature – most of it published in Spanish and unknown in the Anglophone world – I ask what part, if any, the new social and mobile media have played in the emergence and stabilisation of a distinctive nonviolent aesthetics in Spain. My argument is that this new aesthetics is indeed complexly mediated, both by ‘traditional’ mainstream media and by new platforms and technologies such as Facebook, Twitter, YouTube and smartphones. After a brief overview of the indignados movement, I then identify five key principles of its protest aesthetic, concluding that this new aesthetic has positioned Spain – until recently a technological laggard with a dormant civil society – in the global forefront of techno-political innovation and social change. Spanish activists and observers alike agree that the 15 May protests were long overdue. The collapse of the housing market in 2008 had left the Spanish economy in a feeble state, with an overall unemployment rate of 45 per cent among young people, and millions more having to survive on low-paid or seasonal jobs. The combination of a political class discredited by a string of corruption cases, an electoral law that perpetuates a two-party system, and the precedent of pro-democracy uprisings in Tunisia and Egypt, set the scene for a spring of discontent in Spain (López and Rodríguez 2011). The encampments rapidly evolved into ‘cities within cities’ governed through popular assemblies and committees. The committees were created around practical needs such as cooking, cleaning, communicating and carrying out actions. Decisions were made through both majority-rule vote and consensus. The structure was horizontal, with rotating spokespersons in lieu of leaders. Tens of thousands of citizens were thus experimenting with participatory, direct and inclusive forms of democracy at odds with the dominant logic of political representation. Displaying a thorough admixture of utopianism and pragmatism, the new movement drew up a list of concrete demands, including the removal of corrupt politicians from electoral lists, while pursuing long-term revolutionary goals such as giving ‘All power to the People’ (European Revolution 2011). In the Autumn of 2011, Spain’s indignados aligned themselves with related movements in Portugal, Greece, the US and other countries, setting off simultaneous demonstrations in over 1,000 cities around the globe on 15 October. Both Twitter and smartphones played an important role here, along with live streaming and aggregator sites, in bringing together multiple networks of protesters around a set of Twitter hashtags (keywords). Collective Twitter accounts were particularly important bridges across the various locality-based movements (Monterde and Postill forthcoming). Two years ago the indignados occupied the plazas of cities across Spain to protest against the crisis and demand a ‘real democracy’. Now, it seems, indignation is becoming a generalised condition. As said earlier, Spain’s 15M movement is famed for its nonviolence. The indignados have always been swift to respond to repeated attempts by certain conservative news media to attach a ‘radical aesthetic’ to the movement, countering these media representations with widely shared digital contents such as YouTube videos showing police provocateurs disguised as ‘skins’ or ‘radicals’, scenes of peaceful sit-ins brutally broken up the police, posters of demonstrators facing riot police with open hands raised up in the air chanting ‘These are our weapons’ (Estas son nuestras armas) (see Figure 1), and so forth. If the noun ‘aesthetic’ (in the singular), can be defined as ‘a set of principles underlying the work of a particular artist or artistic movement, [e.g.] the Cubist aesthetic’ (Oxford Dictionary 2013), here I will use the term ‘protest aesthetic’ to mean ‘a set of principles underlying the subcultural work and style of a particular protest movement’, in this case the Spanish indignados/15M movement. Five key principles underlie the indignados aesthetic. First, a firm rejection of the ‘diverse tactics’ of earlier mobilisations such as the anti-corporate globalisation movement of the late 1990s and early 2000s, which included (ritually) violent tactics (Juris 2005, 2008). This principle was already in evidence during the launch of Democracia Real Ya in Barcelona in the Spring of 2011, which I attended, and continued to shape the movement’s evolution during and after the May 2011 occupations. Second, the strategic use of humour (Romanos 2013), and more specifically of ‘jocose emotivity’ (Fernandez de Rota 2013) both externally (against the ruling elites, the media, the police, etc.) and internally (as a way of relieving stress and building solidarity among protesters). Third, sophisticated digital practices across the porous social/mainstream media divide, deftly exploiting the unique affordances of different technologies, for example, the virality of the microblogging site Twitter (Postill in press) or the indexicality (Knappett 2002) of YouTube videos. Fourth, the spread of free software/culture ideals and practices through techno-political experiments with direct democracy undertaken in public spaces (Corsin and Estalella 2013). Fifth, a perpetually transient temporality in which the immediate and ephemeral are accorded the same weight as the enduring and long-term. I will now consider each of these aesthetic principles in turn, before recapitulating the argument and concluding with some suggestions for further research. Figure 1. Poster announcing a nonviolence workshop organised by two indignados platforms in Burgos (Spain) in May 2012 (source: Democracia Real YA Burgos). By contrast, for most 15M participants violence should be rejected in all situations, as violence ‘always places itself at the heart of the action, like a whirlwind that suctions and drags everything else’ (Fernandez Savater 2011). 15M activists regard nonviolence as being as essential to the movement as its collective intelligence, horizontality, heterogeneity and inclusion (European Revolution 2011). Nonviolence is a source of strength, not weakness, a collective strategy founded on the belief that it will eventually pay dividends. For Sainz Pezonaga (2011), nonviolence is intrinsic to the movement’s ‘revolutionary logic’, in the sense of not regarding anyone as an enemy, not even politicians, bankers or the police. This was neatly captured, he adds, in the chant ‘Police, join us!’ (¡Policía únete!) heard in the early days of the encampments. In sum, nonviolence trumps the supposed efficacy of violence, putting an end to the ‘tyranny of testosterone’ (Serrano 2011). Politicians of all parties were verbally abused and in some cases pushed around (zarandeados) when they tried to enter […] the Parliament building. The strong police cordon could not prevent some violent scenes. […] [Protesters] painted a black cross on [the regional MP] Montserrat Tura’s raincoat, who said that if the 15M movement wishes to gain prestige, ‘this cannot be based on spray and on marking people as if they were targets. This behaviour is reminiscent of the Nazis.’. Fortunately for 15M supporters, the damage was contained through a counter-demonstration held on 19 June at which large crowds clearly reaffirmed the movement’s nonviolent credentials through embodied, mediated performances such as holding their hands up in the air while chanting ‘These are our weapons’ (Figure 1). Contrary to activists’ complaints about the news media conspiring to label 15M as a violent movement, most mainstream outlets were broadly sympathetic to the movement. For example, the centre-right newspaper El Mundo reported that on 19 June 15M ‘put on display an undeniably peaceful intent which allowed it to recoup the credit it had lost after the violent siege of the Catalan parliament’ (Gonzalez and Mondelo 2011). A week later, the centre-left El País (traditionally close to Spain’s Socialist Party, PSOE), reported that 71 per cent of citizens surveyed regarded 15M as a peaceful movement and ‘only 17 per cent see it as being radical’. The report concluded that the movement had managed to retain 64 per cent of popular support a month after its inception, ‘burying the idea that the incidents linked to the movement had undermined it’. Indeed, ‘79 per cent [of Spaniards] believe the indignados have good reason to protest and support them’ (El País 2011b). I think stepping into the minefield (fregao) of the anti-Pope demonstration wouldn’t be desirable for 15M. Think about it, you only need to give them half a reason to call us crusties (perroflautas) and other nice things, if on top of it we join the demonstration, no one will take us seriously. The crisis was once again overcome via highly visible displays of nonviolence. As in previous incidents, this reaction was warmly received by the mainstream media, with the predictable exception of the more conservative outlets. These successful damage limitation exercises have been a recurrent pattern in the movement’s first two years of life. In June 2013, the left-leaning radio network Cadena Ser (owned, like El País, by the PRISA group) published the results of a survey it conducted among social media users in collaboration with DRY and other indignados platforms. Again, it reported a high level of support for the 15M movement, with 80 per cent of internet respondents having ‘maintained their interest in, or connection to, 15M’, adding that these results confirmed the ongoing erosion of Spain’s two-party system (Cadena Ser 2013) – a conclusion entirely congruent with the indignados’ worldview. Moreover, the movement has no shortage of influential supporters working with(in) leading news organisations as reporters, photographers, editors, bloggers, guest columnists, whistleblowers, and so on. Pending systematic research on this matter, the notion that the mainstream news media as a whole are conspiring with the political and financial class to undermine the 15M movement appears to be unwarranted. As media anthropologists have demonstrated in a range of cultural contexts, including in authoritarian countries such as Egypt, the mass media are always sites of contestation rather than the conspiratorial monoliths they are often made out to be in the activist imagination (see Abu-Lughod 1997; Bird 2010). Whereas affect is unfixed, unstructured, and nonlinguistic, an emotion is one’s personal expression of what one is feeling in a given moment, an expression that is structured by social convention, by culture (Gould 2009: 20). This is an intriguing distinction between affect and emotion, particularly in its stress on the momentariness of emotions, but Gould’s exclusive locating of emotion within the realm of ‘personal expression’ is problematic. Instead, I wish to expand this definition to suggest that an emotion is an expression of what a person and/or a collectivity (e.g. a Puerta del Sol assembly, a Twitter trending topic) is feeling in a given moment, an expression structured by social convention, by technology, and by other cultural elements. Value-rational action is ‘determined by a conscious belief in the value for its own sake of some ethical, aesthetic, religious, or other form of behaviour, independently from its prospects of success’ (Romanos 2013: 3-4, my emphasis). For Romanos (2013: 7), then, there is far more to indignados humour than merely having a good time, for protesters are ‘aware of a number of benefits associated with the use of humour that [go] beyond having fun’. This can be seen in the workshops run by activists to foster individual and collective creativity around, for instance, the making of witty placard messages. Many of these messages ‘subverted already familiar texts’ from popular or political culture, for example, ‘It’s not a crisis. It’s just that I don’t love you anymore’ (‘No es una crisis, es que ya no te quiero’) (Romanos 2013: 7). Indignados often take aim at the mainstream media through slogans such as ‘Don’t turn off your TV, you may accidentally think’ (‘No apagues la televisión… Podrías pensar’, Mayhew 2011). One habitual practice is to humorously counter representations of 15M protesters as ‘crusties’ (perroflautas, see above) popular with Spain’s reactionary news media. One widely shared instance of this line of defence involved the conservative, anti-indignados Intereconomia, ‘doubtless the TV channel that generated the most laughter’ (Fernandez de Rota 2013). Jocose emotivity can be used both externally, to attack the news media, the police, or politicians, and internally, with the aim of fostering a sense of solidarity while relieving stress among protesters (Romanos 2013). An example of the latter orientation was the ‘aerobics assemblies’ held on 12 and 19 June 2011, prior to the general assembly at Puerta del Sol, where ‘[a] group of activists dressed up in tacky and grotesque gym clothes took over the assembly’. Following a series of fitness routines in which the nonverbal language used in assemblies was parodied, the performers became embroiled in an absurd argument over how to redecorate one of the encampment kitchens. The performances ‘served to cool tempers at moments of great stress caused by the intervention of the police or internal arguments’ (Romanos 2013: 9). In the Introduction to this volume, we learned that during the Botswana protests a new form of egalitarianism emerged across class divides through ‘shared celebratory practices and shared suffering.’ This was certainly the case in the streets and squares of Spain, too, but here we should also stress the pervasive mediation of new technologies of sharing, especially social networking sites and smartphones. With the explosive uptake of these media in recent years, hundreds of millions of citizens around the world have acquired the ability to decide how and with whom to ‘share’ digital contents (Postill in press). While early cyberspace scholars announced the coming of an age of ‘virtual reality’ (Turkle 1984), what we are witnessing today is rather the rise of a shared viral reality, i.e. the accelerated co-production and sharing of news and opinion by media professionals and amateurs through social/viral media (Postill in press). The mainstream media may have retained the ability to set the day-to-day current affairs agenda (Chadwick 2011), but they must now contend with the citizens’ new power to share (or not to share) a potentially viral item (Shirky 2008). Like the ‘viral’ images of New York City police pepper spraying two women at #Occupy Wall Street, videos of the eviction and the aggressive police response, including their wrestling to the ground of several clearly nonviolent members of Veterans for Peace, circulated widely via social and mainstream media platforms, generating widespread sympathy for #Occupy Boston. This afternoon’s march […] would again draw several thousand protesters. It would also be one of more than a thousand October 15 #Occupy protests around the world, a testament to the viral circulation of protest in an era of social media. (Juris 2012: 259). Along similar lines, Donovan (2012) describes Occupy as ‘a social change network that leverages both online and offline social networking to propagate ideas and produce distributed direct actions.’ Comparable processes have taken place in Spain, for instance following the earlier mentioned eviction of protesters from Barcelona’s Plaça de Catalunya on 27 May 2011 which ‘went viral’ within a matter of minutes. In the 15M imaginary, today’s viral sophistication portends tomorrow’s political emancipation. The indignados’ exaltation of virality is a form of discourse in which technology and grassroots politics are seen as being inextricably tied. Virals are regarded as an expression not only of popular indignation but also of an increasingly internet-savvy citizenry taking on an obsolescent system run by technological illiterates. Thus the influential 15M activist and researcher Javier Toret, a psychologist by training, argues that the viral technologies helped to create ‘a collective mood’ in Spain. Before the 15M movement, he jokes, ‘we nerds (frikis) of the world were all alone and friendless.’ For Toret, ‘emotions are political’ and 15M tweets carry twice as much ‘emotional load’ (carga emocional) as non-15M tweets. This renders them inherently more ‘viral’ (El Diario 2013). Figure 2. An indignados visual design exemplifying the movement’s viral strategy of nonviolence (source: media/anthropology blog). This brief text and picture capture with rare clarity the indignados’ dual commitment to viral reality and to nonviolence – indeed, in the 15M universe the two are mutually constitutive. 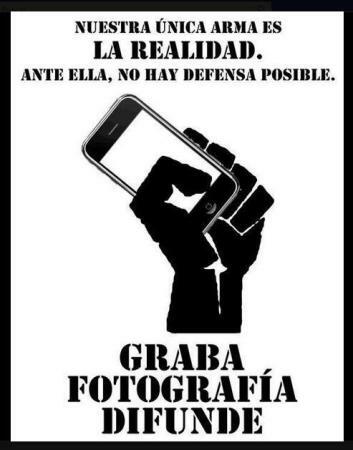 That is, 15M nonviolence and its necessary counterpart, police and government violence, can only become a reality in the public consciousness if citizens make use of their mobile and online devices to ‘record, photograph, (and) spread’ them. In terms of Peirce’s semiotics, 15M (audio) visual propaganda exploits the iconic indexicality of film and photography (Knappett 2002), that is, the direct causal link obtaining between a photographic or filmic image and the object it represents (in this case, police brutality), in order to bolster the movement’s nonviolent credentials. It is now customary to spend the day after a strike or demonstration watching the hundreds of videos of police brutality that circulate through social networks. The [14 November] strike has, as expected, added a few more titles to our film library. […] We share videos, examine photographs more suited to a forensic inquiry (split heads, bruised backs, even eye-gouging) and gather information to count the victims: how many wounded, how many arrested, how many journalists assaulted, how many police infiltrators […]. It’s beginning to feel like a routine, another day in the cycle of protests (Rosa 2012). Although the popular revolts in Tunisia, Egypt and other Arab countries were a source of great inspiration to indignados and occupiers on both sides of the Atlantic, we should not lose sight of another key source of ideas, technologies and personnel, namely the free culture/internet freedom movement epitomised by formations such as Wikileaks, Anonymous, the P2P Foundation or the Free Culture Forum. Over the past few years we have witnessed the mainstreaming of this broad movement, with previously marginal, ‘geeky’ initiatives such as Wikileaks or Anonymous becoming household names around the globe thanks to the complicity of mainstream media such The Guardian, El País, or The New York Times. I propose to call this trend the mainstreaming of nerd politics (pace Doctorow 2012). The link between this global trend and the 2011 and 2013 waves of protests remains poorly understood. An ideal entry point to this question is The Revolution Will Be Digitised (2011), a prescient book completed by the journalist Heather Brooke as the Tunisian uprising was breaking out in December 2010. Brooke investigates the goals and activities of internet activists in the United States, Iceland, Germany and other countries as part of an inquiry into the ‘Information War’ pitting them against powerful governments and corporations. She notes the centrality of ‘hackerspaces’ to their endeavours. These are horizontal, democratic physical spaces devoted to ‘playfully creative problem solving’ (i.e. hacking) shaped by their users’ pragmatism and anti-authoritarianism (2011: 23; see also Coleman 2012). Transposing this idea to the 2011 movements, I wish to suggest that geeky indignados took their hackerspaces to the streets and squares of urban Spain where they hybridised them with other context-specific practices and technologies. In doing so, they created new forms of techno-political praxis, civic engagement and protest aesthetics, some of which later diffused to the United States and elsewhere via the Occupy movement where they continued to hybridise and mutate. As I explained in the preface, the influence of the free culture scene on Spain’s 15M movement was seminal. According to Gutierrez (2013), Madrid’s hackerspaces have evolved a unique 21st century hacker aesthetic distinct from the aesthetics of other free culture hubs in Europe. From the end of the ‘90s, free culture became entangled in Madrid with social movements [located] in squats (centros okupa) such as El Laboratorio. While Berlin’s squatters are still wedded to a punk aesthetic and a classic anti-Fascism, in Madrid’s over thirty Squatted Social Centres, a new networked world is being created – a horizontal, aggregating world. A new world imbued with a hacker ethic that dissolves all online/offline borders. […] [These centres] are extensions of the squares occupied in the Spring of 2011 (Gutierrez 2013). Other advocates of free-culture inspired political reform (or revolution) are, however, more cautious (e.g. Doctorow 2012). Following fieldwork at the intersection of Madrid’s free culture and indignados scenes, the Spanish anthropologist Adolfo Estalella stresses the enormous effort of ‘translation’ required when seeking to apply online ‘logics of collaboration’ to offline contexts – the same conclusion reached by Kelty (2008) some years earlier following transnational ethnohistorical research on the free software movement. Estalella (2013) notes that when the notion of commons (procomún) is invoked in 15M circles, this is often done in dramatic terms. Thus the commons becomes both ‘a threatened good’ (un bien amenazado) and a dramatic genre designed to produce a new ‘urban sensitivity’ through neighbourhood assemblies and other grassroots formations. These caveats notwithstanding, the hybridisation of hacker/free culture and protest ideals, practices and aesthetics is a multifarious process with potentially far-reaching consequences. Spain’s ongoing techno-political experimentation and innovation are undeniably world class – a result of Spain’s unique combination of a bankrupt political economy, a thriving squatter-hacker subculture, and a vast pool of qualified young people unable to find employment and therefore able and willing to invest their creative labour in the new movement. The fifth and final principle in the indignados’ protest aesthetic is its perennially transient temporality. By this I mean the paradoxical blending of ephemerality and endurance in 15M participants’ orientation towards the future. On the one hand, the indignados borrow from Mexico’s Zapatistas the idea that ‘We walk, not run, because we are going very far’ (Sitrin 2005). This idea can be seen at work across the vast universe of 15M discursive practices, both online and offline. As the activist anthropologist Asur Fuente put it in June 2011, ‘One cannot demand an ideology (un ideario) from 15M, for what they are looking for is a social change. Besides, you cannot expect the same from a one month-old movement as you do from a 130 year-old party’ (quoted in Vega 2011). In some contexts, the idea can take on more of a free/hacker culture character, for instance in the public space experiments discussed in the previous section in which, by analogy to free software coding, modifying and sharing, the indignados’ outputs can be seen as ‘techno-political prototypes’ that are perennially ‘in beta’ (Corsin and Estalella 2013). On the other hand, indignados’ personal and collective actions are characterised by an ‘inevitable and attractive aesthetic of the urgent and fleeting’ (Albeida 2011: 98). In the occupied spaces, new forms of popular action arose that did not require to be expressed ‘through lasting artistic manufactures, but rather through a common creativity that emerged spontaneously out of the need to be there and to protest’ (2011: 97). This fleeting quality is beautifully captured by the ‘analogue Twitter’ co-created by Plaça de Catalunya occupiers and 15M sympathisers in mid-May 2011, at the height of the encampments (see Figure 3). This ‘fantastic invention’ consisted of a large pedestal covered in post-it notes. Passers-by were encouraged to share their brief thoughts and messages with fellow citizens and visitors. In effect, this was microblogging transposed from the internet to a physical space: ‘When the wind blows, [the post-it notes] are as ephemeral as tweets’ (Senabre 2013). Figure 3. An ‘analogue Twitter’ created by occupiers and visitors of Plaça de Catalunya, in Barcelona, in mid-May 2011. 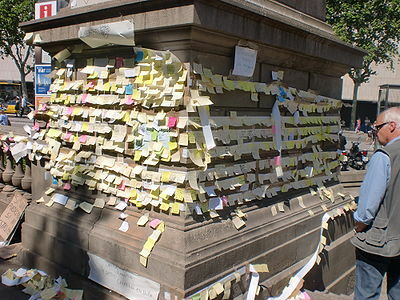 ‘When the wind blows, [the post-it notes] are as ephemeral as tweets’ (Senabre 2013) (source: Estigmergia.net). Perpetual transience is also present online, and particularly on Twitter. If YouTube quickly emerged as the ideal platform on which to share evidence of police brutality, owing to the inherent indexicality of its audiovisual format (see above), Twitter is the world’s preeminent site for the collaborative making and unmaking of transient publics. Although efforts were made in the past to form Twitter ‘tribes’ (known as Twibes) around shared interests such as soccer, sociology or Bollywood, these all foundered. Instead, the hashtag-driven logic of Twitter favours users’ engagements with one another via fleeting threads of conversation, not enduring groups (Postill forthcoming). Over time the indignados have learned how to ‘work the algorithm’ so that their concerns will became ‘trending topics’ on Twitter, thereby helping to shape the political and media agenda. To recall Habermas’ (1987) famous distinction between ‘the lifeworld’ and ‘the system’, the indignados may practice and preach ‘real democracy now’ in their lifeworld assemblies, but when it comes to their hopes for systemic change, they expect to attain real democracy only at some undefined point in the future. As they are wont to say, ‘This is only the beginning’. In July 2011 the Spanish radical leftist website Kaos en la Red published a rant by the hip-hop artist Nega (2011) that goes to the heart of this chapter. Charging against the ‘slogans and false prophets’ of the nascent indignados movement, Nega’s critique can be summed up in three main points. First, he attacks the indignados’ ‘almost pathological obsession’ with nonviolence – not the nonviolent civil rights protests in 1960s America, but rather a ‘decaffeinated’ version whose advocates ‘would not hesitate to brand as terrorists the hippies who chained themselves to the rail tracks to stop weapons from being shipped to Vietnam.’ To Nega, the 15M notion of nonviolence was designed by the large media corporations: whilst throwing paint or an egg becomes ‘terrible anti-system violence’, the latest labour reform is not violence but unavoidable collateral damage. Second, he regards 15M as anything but a radical movement. Being radical is ‘getting to the root of a problem’ not dreaming up bland slogans such as ‘For a just justice’ that even the most reactionary sectors of the right would subscribe to. Given that the indignados’ intellectual referents are contemporary media personalities rather than ‘Marx, Mao or Marcuse (or Debord, Foucault or Sartre)’, we should not expect from them profound or radical graffiti (after all, this would be vandalism). At best we can hope for dull cardboard slogans such as ‘We are not anti-system, the system is anti-us’ or ‘They don’t represent us’. Third, Nega argues that the 15M movement suffers from a culture of immediacy. Being ‘slaves to the ephemeral’, the indignados are caught in an endless loop in which they produce prodigious numbers of ‘little books’ (libritos) with titles such as Be Outraged, Commit, or React that ‘saturate our bookshops’ and are recommended by the country’s main department stores. This is not the place for an extended response to this spirited piece. Instead, I will use it as a way to recapitulate my argument about the mediated aesthetics of 15M nonviolence. Let us take up first Nega’s remark about the indignados’ ‘almost pathological obsession’ with nonviolence. As we have seen, there were sound historical reasons for choosing nonviolence. This strategy possesses a logic of its own, a logic that is regularly reaffirmed through technologically shared images, words and deeds, namely the belief that violence and nonviolence are incompatible. By rejecting the ‘diverse tactics’ and ‘radical aesthetics’ of previous mobilisations against corporate globalisation (Juris 2005, 2008), the indignados managed to include in their struggle millions of Spaniards who would have otherwise kept their distance from the protests. This is succinctly captured in the slogan ‘Without violence there are more of us’ (‘Sin violencia somos más’) (Tarin 2011). An avoidance of radical aesthetics, however, does not mean that the indignados movement lacks radicalism. In early 2011, when Spain’s political class approved copyright legislation under US government pressure, as confirmed by Wikileaks via El País, the same internet activists who had campaigned to block the new legislation went on to form NoLesVotes, a platform that called on the Spanish people not to vote for any of the major political parties. Shortly thereafter, NoLesVotes formed a coalition with Anonymous, Juventud Sin Futuro and other emergent groups under the umbrella platform Democracia Real Ya (DRY) which organised the 15 May 2011 marches that were to transform Spain’s political climate within days. This amounted to a schism between vast sections of the Spanish population led by 15M ‘non-leaders’ and the political and financial elites – with the police, the media, academia and other societal fields finding themselves caught in the middle of a protracted conflict that is far from being resolved at the time of writing (July 2013). In other words, by declaring a radical break from the existing political order – representative democracy – the indignados are paving the way for radical change. Whether this will take the shape of gradual reform or sudden revolution remains to be seen, but we can be certain that there will be no returning to Spain’s stagnant ‘transition culture’ (VV.AA. 2012) that followed the end of the Franco regime in 1977. Finally, the accusation that the indignados are ‘slaves to the ephemeral’ is baseless. The 15M movement has in fact developed a political aesthetics that conjoins the ephemeral with the enduring. Twitter trending topics, tent cities, Facebook groups and barrio assemblies may come and go, but the widespread realisation that Spain’s political system is in acute need of repair (or replacement) has not gone away. We caught several glimpses earlier of how the indignados language has entered Spain’s ‘national conversation’. Ironically, this was possible thanks to the support of the supposedly pro-Establishment news media. Recall, for instance, how the centre-left broadcaster Cadena Ser, traditionally close to the Socialist Party (PSOE), ‘confirmed’ the erosion of Spain’s two-party system on the basis of a survey jointly conducted with several indignados platforms. A key finding of this research is indeed the gap between 15M rhetoric about a monolithic ‘mainstream media’ (los medios de comunicacion) seeking to undermine the movement and the actual discursive practices of news media organisations which are often, in my experience, quietly pro-15M. Further research is urgently required on the actual (as opposed to imagined) coverage of the movement by the mainstream media. Such research is likely to complicate these simplistic portrayals. Indignados activists are understandably prone to ‘outing’ police infiltrators via social media, but we should not overlook the importance of the movement’s own ‘discursive infiltrators’, that is, journalists, intellectuals, artists and others who are active 15M participants, or at least supportive of the movement, and help to shape public opinion in their favour through their mainstream reporting, commentary, art installations, and so on. All in all, far from being Nega’s shallow, ‘decaffeinated’ version of the 1960s civil rights movement, the indignados’ mediated aesthetic has been pivotal to the growth and maintenance of the movement, as well as transforming Spain into an unlikely global leader in techno-political innovation. Further comparative work is also needed on the diachronic and processual dimensions of mediated aesthetics in Spain and other states. In the contemporary era in which variously positioned political actors (rulers, politicians, activists, journalists, citizens, etc.) have access to multiple media, when analysing a struggle it is crucial that we establish which media ensembles – or media mixes – came to the fore at which particular stages of the conflict (Monterde and Postill forthcoming). Here I have only been able to sketch the unique aesthetic ‘package’ that makes up the 15M movement in a rather synoptic, ‘snapshot’ manner. A future diachronic, phase-by-phase analysis (Postill 2012) of how this political aesthetic unfolded over time will allow me to shed light on its ‘field dynamics’ (Postill forthcoming), not least on the part played by old-school leftists like Nega who feel excluded from the indignados’ inclusiveness. This chapter is based on fieldwork funded by the Internet Interdisciplinary Institute (IN3), Open University of Catalonia (UOC), in Barcelona, where I was a Senior Research Fellow in 2010-2011. Some passages from the Preface and from the section ‘The indignados movement’ are adapted from Postill (in press). Abu-Lughod, L. (1997), ‘The interpretation of cultures after television,’ Representations 59 (Summer): 109-134. Ainger, K. (2013), ‘In Spain they are all indignados nowadays,’ The Guardian, 28 April 2013. http://m.guardian.co.uk/commentisfree/2013/apr/28/spain-indignados-protests-state-of-mind (Accessed 2 July 2013). Albeida, J. (2011), ‘Vivir la plaza, autogestionar la democracia,’ Vínculos del frío. Latitud norte: Ética y estética del habitar, Proceedings of the 3rd International Conference on Art and the Environment, Valencia, 16-18 November 2011, pp. 95-99. Atack, I. (2012), Nonviolence in Political Theory, Edinburgh: Edinburgh University Press. Barassi, V. and E. Treré, E. (2012), ‘Does Web 3.0 come after Web 2.0? Deconstructing theoretical assumptions through practice,’ New Media & Society 14, 8: 1269-1285. BBC (2012) ‘Ex-Bankia chief Rodrigo Rato in Spanish court’, 20 December 2012. http://www.bbc.co.uk/news/business-20803805 (Accessed 2 July 2013). Bird, S. E. (ed) (2010), The Anthropology of News & Journalism: global perspectives. Bloomington & Indianapolis: Indiana University Press. Cadena Ser (2013), ‘Resultados #Encuesta15M. El 80% mantiene su interés o vinculación con 15M’, 15 May 2013. http://www.cadenaser.com/tecnologia/articulo/mantiene-interes-vinculacion-15m/csrcsrpor/20130515csrcsrtec_2/Tes (Accessed 2 July 2013). Castells, M. (2011), ‘#Wikiacampadas’, La Vanguardia, 28 May 2011. http://www.lavanguardia.com/opinion/articulos/20110528/54160922879/wikiacampadas.html (Accessed 2 July 2013). Castells, M. (2012), Networks of outrage and hope: Social movements in the Internet age, Maiden, MA: Polity. Chadwick, A. (2011), ‘The hybrid media system,’ paper to the European Consortium for Political Research General Conference, Reykjavik, Iceland, 25 August 2011. Coleman, G. (2012), Coding Freedom: The Ethics and Aesthetics of Hacking, Princeton: Princeton University Press. 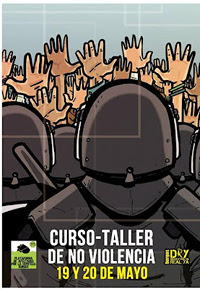 Corsin, A. and A. Estalella (2013), ‘Asambleas populares: el ritmo urbano de una política de la experimentación,’ in Marta Cruells y Pedro Ibarra (eds), La democracia del futuro: del 15M a la emergencia de una sociedad civil viva, Madrid: Icaria Editorial. El Diario (2013), ‘El 15-M ha permitido hibridar participación digital y analógica,’ 22 February 2013. http://www.eldiario.es/catalunya/permitido-hibridar-participacion-digital-analogica_0_103939610.html (Accessed 2 July 2013). Doctorow, C. (2012), ‘The problem with nerd politics,’ The Guardian, 15 May 2012. Donovan, J. (2012) ‘How Occupy birthed a rhizome’, Waging Non Violence, 17 September 2012, http://wagingnonviolence.org/feature/how-occupy-birthed-a-rhizome/ (Accessed 2 July 2013). El País (2011a), ‘Los diputados salen del Parlamento sin problemas y los indignados levantan el cerco’. http://politica.elpais.com/politica/2011/06/14/actualidad/1308054979_810918.html (Accessed 2 July 2013). Estalella, A. (2013) ‘El procomun no es un commons’, Prototyping, 27 May 2013. http://www.prototyping.es/procomun/el-procomun-no-es-un-commons (Accessed 2 July 2013). European Revolution (2011), ‘Three months of struggle: an overview of the #15m movement and the #SpanishRevolution’, Take the Square, http://takethesquare.net/2011/08/20/three-months-of-struggle-an-overview-of-the-15m-movement-and-the-spanishrevolution/ (Accessed 2 July 2013). Fernandez de Rota, A. (2013), ‘El acontecimiento democrático. Humor, estrategia y estética de la indignación’, Revista de Antropología Experimental 13: 1-20. Fernandez Savater, A. (2011), ‘Apuntes sobre la noviolencia del 15-M,’ Fuera de lugar, 3 August 2011. http://blogs.publico.es/fueradelugar/707/apuntes-sobre-la-noviolencia-del-15-m (accessed 7 July, 2013). Gelderloos, P. (2007), How Nonviolence Protects the State, Boston: South End Press. Gonzalez, G. and V. Mondelo (2011) ‘Los ‘indignados’ se desmarcan de la violencia con una marcha masiva en Barcelona,’ El Mundo, 19 June 2011. http://www.elmundo.es/elmundo/2011/06/19/barcelona/1308496382.html (accessed 7 July, 2013). Gould, D.B. (2009), Moving politics: Emotion and ACT UP’s fight against AIDS, Chicago: University of Chicago Press. Gutierrez, B. (2013), ‘La Comuna (P2P) de Madrid’, Codigo Abierto, 31 May 2013. http://blogs.20minutos.es/codigo-abierto/2013/05/31/la-comuna-p2p-de-madrid/ (accessed 7 July, 2013). Habermas, J. (1987), The Theory of Communicative Action, Volume 2. Lifeworld and System: A Critique of Functionalist Reason, Boston: Beacon Press. Hands, J. (2010), @ Is for Activism, London: Pluto. Haugerud, A. (2013), No Billionaire Left Behind: Satirical Activism in America, Standford: Standford University Press. Juluri, V. (2005), ‘Nonviolence and Media Studies,’ Communication Theory 15, 2: 196–215. Juris, J.S. (2005),‘Violence Performed and Imagined: Militant Action, the Black Bloc and the Mass Media in Genoa,’ Critique of Anthropology 25, 4: 413–432. Juris, J. S. (2008), Networking Futures: The Movements against Corporate Globalization, Durham, NC: Duke University Press. Juris, J.S. (2012), ‘Reflections on #Occupy Everywhere: Social Media, Public Space, and Emerging Logics of Aggregation’, American Ethnologist 39, 2: 259-279. Juris, J.S. and M. Razsa (2012), ‘Introduction: Occupy, Anthropology, and the 2011 Global Uprisings,’ Cultural Anthropology Hot Spots, 27 July 2012. http://culanth.org/?q=node/641 (Accessed 2 July 2013). Kelty, C. (2008), Two Bits: The Cultural Significance of Free Software, Durham, NC: Duke University Press. Knappett, C. (2002), ‘Photographs, skeuomorphs and marionettes: some thoughts on mind, agency and object,’ Journal of Material Culture 7, 1: 97-117. La Quadrature (2010), ‘X.net’, 17 February 2010. http://www.laquadrature.net/en/exgae (Accessed 2 July 2013). Lopez, I. and E. Rodriguez (2011), ‘The Spanish model’, New Left Review 69, May-June 2011: 5-29. Martin, B. (2008), ‘How nonviolence is misrepresented,’ Gandhi Marg 30, 2: 235-257. Massumi, B. (2003), ‘Navigating Moments with BrianMassumi,’ in M. Zournazi, Hope: New Philosophies for Change. New York: Routledge, pp. 240-241. Mayhew, J. (2011), ‘Indignados’, Bemsha SWING!, 8 August 2011. http://jonathanmayhew.blogspot.com.au/2011/08/indignados.html (Accessed 2 July 2013). Monterde, A. and J. Postill (forthcoming), ‘Mobile ensembles: The uses of mobile phones for social protest by Spain’s indignados,’ in G. Goggin and L. Hjorth (eds), Routledge Companion to Mobile Media, London: Routledge. Morozov, E. (2011), The Net Delusion: The Dark Side of Internet Freedom, New York: Public Affairs. Nega (2011), ‘Cultura y estética del 15-M: de eslóganes y falsos profetas’. Kaos en la red, 2 July 2011. http://old.kaosenlared.net/noticia/cultura-estetica-15-m-esloganes-falsos-profetas (Accessed 2 July 2013). Onda Precaria (2011), ‘NoViolencia, metodología y ADN del movimiento (Abecedario del 15-M. III Parte),’ 8 August 2011.http://ondaprecaria.wordpress.com/2011/08/08/el-camino-alegre-de-la-noviolencia-abecedario-del-15-m-iii-parte/ (Accessed 2 July 2013). Oxford Dictionary 2013. ‘Aesthetic’. http://oxforddictionaries.com/definition/english/aesthetic (Accessed 2 July 2013). Postill, J. (2008), ‘Localising the Internet beyond Communities and Networks,’ New Media and Society 10, 3: 413–31. Postill, J. (2009) ‘Social media activism in Barcelona – a few questions,’ Media/anthropology, 19 November 2009. https://johnpostill.com/2009/11/19/social-media-activism-in-barcelona-a-few-questions/ (Accessed 2 July 2013). Postill, J. (2010), ‘An eventful fortnight for Catalonia,’ 22 July 2010. https://johnpostill.com/2010/07/22/an-eventful-fortnight-for-catalonia/ (Accessed 2 July 2013). Postill, J. (2011), Localizing the Internet: An Anthropological Account, Oxford: Berghahn Books. Postill, J. (2012), ‘Media and social changing since 1979: Towards a diachronic ethnography of media and actual social changes,’ paper presented to the EASA 2012 biennial conference, Nanterre, Paris, July 2012. Postill, J. (forthcoming), ‘Public anthropology in times of media hybridity and global upheaval,’ In S. Abram and S. Pink (eds), Media, Anthropology and Public Engagement, Oxford: Berghahn. Postill, J. (in press), ‘Democracy in the age of viral reality: a media epidemiography of Spain’s indignados movement,’ Ethnography. Romanos, E. (2013), ‘The strategic use of humour in the Spanish indignados Movement,’ paper to the 20th International Conference of Europeanists, Amsterdam, 25-27 June 2013. Rosa, I. (2011), ‘Violencia en el Parlament (en el exterior)’, Publico, 16 June 2011. http://blogs.publico.es/trabajarcansa/2011/06/16/violencia-en-el-parlament-en-el-exterior/ (Accessed 2 July 2013). Rosa, I. (2012), ‘Violencia policial: ¿qué tiene que pasar para que alguien tome medidas?’ El Diario, 15 November 2012. http://www.eldiario.es/zonacritica/represion_huelga_general_policia_6_69353080.html (Accessed 2 July 2013). Sainz Pezonaga, A. (2011), ‘Asambleas abiertas, no-violencia, no-representación. La diferencia del 15 M’. Rebelion, 21 June 2011. http://www.rebelion.org/noticia.php?id=130832 (Accessed 2 July 2013). Samad, S.A. (2009), ‘Non-violence in the Civil Rights Movement in the United States of America,’ Unpublished PhD thesis, Freie Universität Berlin, 18 February 2009. Sánchez, J.L. (2011) ‘Los primeros 40 de Sol’, Periodismo Humano, 26 May 2011, http://periodismohumano.com/temas-destacados/los-primeros-40-de-sol.html (Accessed 2 July 2013). Senabre, E. (2011), ‘Dispositivos de información en la plaza,’ Estigmergia, 26 May 2011. http://www.estigmergia.net/wiki/Dispositivos_de_informaci%C3%B3n_en_la_plaza (Accessed 2 July 2013). Serrano, E. (2011) ‘El poder de las palabras: glosario de términos del 15M,’ Madrilonia, 23 June 2011. http://madrilonia.org/2011/06/el-poder-de-las-palabras-glosario-de-terminos-del-15m/ (Accessed 2 July 2013). Shirky, C. (2008), Here comes everybody: The power of organizing without Organizations, New York: Penguin Press. Sitrin, M. (2005), ‘‘Walking We Ask Questions’: An Interview with John Holloway,’ Left Turn, 1 February. http://www.leftturn.org/%E2%80%9Cwalking-we-ask-questions%E2%80%9D-interview-john-holloway (Accessed 2 July 2013). Sumner, D. E. (1995), ‘Nashville, nonviolence, and the newspapers: The convergence of social goals with news values,’ Howard Journal of Communications 6, 1-2: 102-113. Sutton, M. (2012), ‘Spain’s Ley Sinde: New Revelations of U.S. Coercion,’ Electronic Frontier Foundation, 9 January 2012. https://www.eff.org/deeplinks/2012/01/spains-ley-sinde-new-revelations (Accessed 2 July 2013). Tarin, S. (2011), ‘Sin violencia somos más,’ Público, 17 June 2011. http://www.publico.es/espana/382401/sin-violencia-somos-mas (Accessed 2 July 2013). Tufekci, Z. (2011), ‘Faster is Different: Brief Presentation at Theorizing the Web’, Technosociology, 13 April 2011, http://technosociology.org/?p=424 (Accessed 2 July 2013). Vega, J. A. (2011, ‘Asur Fuente: «En el 15-M vamos despacio porque vamos lejos»’, LNE.es, 21 June 2011. http://www.lne.es/cuencas/2011/06/21/asur-fuente-15-m-despacio-lejos/1092390.html (Accessed 2 July 2013). VV.AA. (2012), CT o la cultura de la transición: Crítica a 35 años de cultura española, Barcelona: Debolsillo. Weber, M. (1978), Economy and Society, Guenther Roth and Claus Wittich (eds), Berkeley: University of California Press. Yurchak, A. (2005), Everything Was Forever, Until it Was No more: The Last Soviet Generation, Princeton: Princeton University Press. See his online article: http://www.lavanguardia.com/opinion/articulos/20110528/54160922879/wikiacampadas.html. (Accessed 2 July 2013). By ‘virality’ I mean the propensity social media technologies have for the epidemic, person-to-person (‘viral’) spread of digital contents (so long, that is, as these contents are of interest to a large number of people who will feel compelled to ‘share them’ through their personal networks). As I explain below, ‘indexicality’ refers to the direct causal relationship that exists between a still or moving image and the object it represents. In other words, just as smoke is an index of fire, a video of a journalist being assaulted by riot police is (likely to be) an index of police brutality. In contradistinction, a drawing has an indirect causal link to the object it represents (see Knappett 2002). See, e.g. Fernandez Savater (2011), Onda Precaria (2011), Sainz Pezonaga (2011). This is a recently coined term of abuse popular with Spain’s more conservative commentators. It is a compound of the Spanish words for ‘dog’ (perro) and flute or recorder (flauta). Its nearest English equivalent is arguably ‘crusty’: ‘(Sociology) Slang a dirty type of punk or hippy whose lifestyle involves travelling and squatting’ (see http://www.thefreedictionary.com/crusty). These include the copyright lawyer and internet activist Carlos Sanchez Almeida (who blogs for the right-leaning El Mundo), the sociologist Manuel Castells (La Vanguardia) or journalists such as Joseba Elola (El País), Lali Sandiumenge (La Vanguardia and others) and Leila Nachawati (Al Jazeera and others), to name but a few well-placed indignados. https://twitter.com/PabloHasel/status/268821309746716672 (Accessed 2 July 2013). https://johnpostill.com/2012/03/29/our-only-weapon-is-reality/ (Accessed 2 July 2013). ‘Caminamos, no corremos, porque vamos muy lejos’ in the Zapatista slogan, or, in the indignados variant, ‘We go slowly because we are going far’ (‘Vamos despacio porque vamos lejos’) (Vega 2011). http://www.estigmergia.net/wiki/Dispositivos_de_informaci%C3%B3n_en_la_plaza (Accessed 2 July 2013). [youtube Non-violence has always been an inspiration to 15M. The Movement resurrected peaceful resistance and adapted it to the Internet age. Repudiating weapons and classic urban guerrilla tactics, 15M made protest creative, constructive and, unmistakably, fun. Networked emotions and viral actions that amplified and altered their own effects. Culture Jamming, the remixing of logos and commercial symbols as exemplified by Adbusters, morphed into something else in Spain. 15M’s culture jammers became virtual DJs, spinning memes and emotions. We saw how Flo6x8, a flash mob collective, was able to flamenco their way into a bank. We saw a crowd throwing a party in a Bankia branch, to promote its #CierraBankia (#ShutDownBankia) campaign. Bankia was Spain´s own big-bank-bailout debacle, going from public bank to private entity, subsequently bankrupting itself and then controversially being rescued with public funds, concurrent with the imposition of austerity measures. We were delighted by the parodical Ballot Box ATM: if it´s the banks that really govern us after all, why not just vote directly while at the bank?